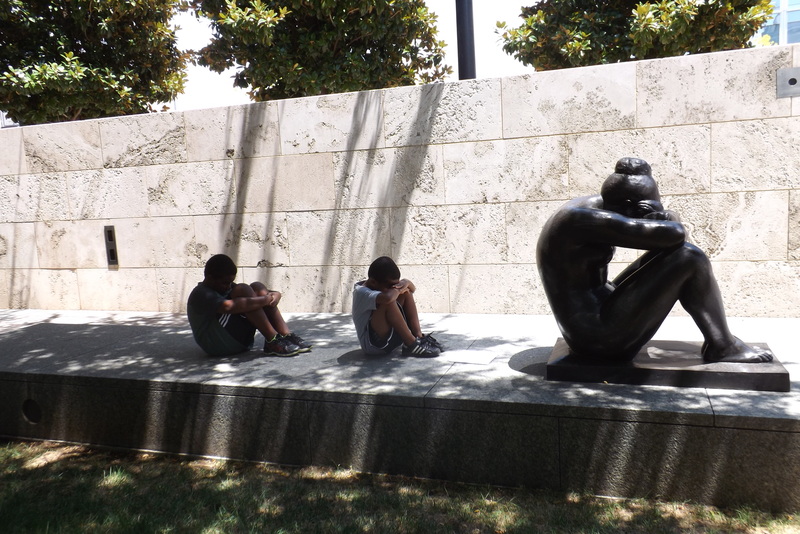 My children mimicking the pose of the La Nuit by Aristide Maillol ay the Nasher Sculpture Center, Dallas, Texas. Today is a great day to check out the Dallas Arts District! The Nasher Sculpture Center hosts Target First Saturdays, where admission is free of charge. There are activities for children and adults, for example tours of the center, scavenger hunt, and yoga on the lawn. Enjoy the morning at the Nasher and then stop by the Klyde Warren Park for lunch. There are several food truck with delicious snack and restaurant worth meals. The park is a beautiful green space nestled above a bustling highway below. Sitting on the green, you would be hard pressed to guess the freeway was below you. There are often free vents at the park, as well. After you have eaten and rested a bit, head for a short 2minute walk across from the park to the Dallas Museum of Art (DMA). General admission is free to the public. At 2:00pm every Saturday is the Spotlight at the DMA to showcase some of the highlights of the artwork and artifects displayed. Theese are just a few ideas on how to enjoy the Dallas Arts District today. Design your own itinerary and check out some of the other venues in the district. I have listed the websites below for you. Have a “marvalous” Saturday.